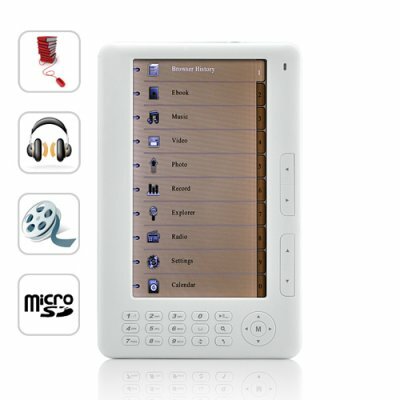 Successfully Added eBook Reader "Mebook" - 7 Inch, Media Player, 4GB to your Shopping Cart. A powerful ebook reader that reads all the most popular ebook formats. Just like The Amazon Kindle. A super media player that plays the Internet's most widely downloaded audio and video formats. Just like The iPod Touch. Brought together in a stylish body that's simply attractive and attractively simple to use. Introducing The Mebook 7 Inch High Resolution eBook Reader + Super Media Player - prepare to be amazed! Like a Kindle: The first thing you'll notice when you pick up The Mebook is that it feels really natural to hold. So comfortable...perfect when you're on a long flight, perfect when you're in bed, perfect at lunch...The Mebook in one hand and a roast beef and swiss on dark rye with a smidgen of mustard in the other hand. Ahhh happiness! In fact The Mebook will soon be your new best friend what with its ability to flawlessly play TXT, FB2, PDF, and EPUB ebook format files which means you'll never be at a loss for something interesting to read. In fact, look at the FAQ's below for some suggestions on where to find interesting reading gems. Like an iPod Touch: But life would be boring indeed if entertainment consisted of text alone. The Mebook has you covered there with its over the top ability to play the best audio and video formats including MP3, OGG, WAV, AAC, APE, AMC, AMV, and FLAC (yes that's right, this monster plays FLAC files!) as well as DAT, VOB, FLV, 3GP, RM, RMVB, MP4, AVI, and MKV (yes that's right, this monster plays MKV files!) And it does so in 720p video glory!). Even the iPod Touch...can't Touch this! But so much better than both... Such rewarding functionality packaged in a slim body that is light and sturdy with a 7 inch high definition screen along with 4GB of internal memory and a TF microSD card slot for further memory expansion along with a heavy duty 1800 mAh battery all leads to one simple conclusion - The Mebook is sure to be your favorite electronic gadget for many years to come! Brought to you by the leader in cutting edge electronics - Chinavasion. just have a little problem is the user manual not very easy to understand would like an easier version other than that very impressive. the e-book is a very good reader media player, fast delivery. The Reader is really Good. I find time-lag between video and audio while playing any video(might get some answer from support team on that). This is a great little reader at a price that is amazing - even including delivery from China to Europe it is a very good deal. It is fast and switching between applications is very easy. The only downside is the manual which would benefit from a keyboard layout for quick reference. Having said that a little reading will get you started in no time. Although I only purchased this for the reader function I downloaded a movie and I was very impressed. The reader is really nice. The only flaw is the Italian translation of the software was not very well, but ok to use it !! I forgot .... I was impressed with how you see the movie!